Incapsula offers any online business the right selection of website security and performance services to meet its needs. 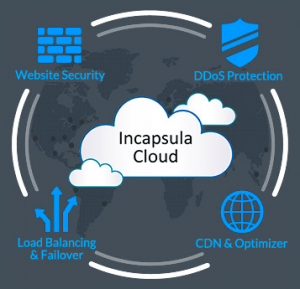 Whether you need a Web Application Firewall or DDoS Protection, CDN or Failover solutions, Incapsula’s got you covered. Our inclusive, fully integrated Application Delivery solution allows businesses to simplify their IT operations and reduce costs by consolidating multiple services and appliances into a single enterprise-grade cloud service. Unmatched web application security experience, enhanced by real-time big data analytics, allows Incapsula to provide best-of-breed security to the world’s most security-conscious businesses. Our website security solution redefines and extends the WAF beyond traditional concepts. An advanced client classification engine analyzes all incoming traffic to your site, preventing access to malicious and unwanted visitors. Incapsula secures websites against all types of DDoS attacks—including network, application, and DNS targeted attacks—with zero business disruption. Leveraging a high-capacity global network and dedicated 24/7 NOC, this “always on” service ensures enterprise-grade uptime SLA even when under attack. In addition, infrastructure protection lets enterprises protect entire subnet ranges from OSI network-layer attacks. Incapsula’s application-aware CDN is the platform through which we deliver enterprise grade security and performance services. Comprised of a worldwide distributed network, it boosts your website performance through advanced caching and optimization techniques. On average, websites using Incapsula are 50% faster and consume 60% less bandwidth. Incapsula’s Load Balancing & Failover service enables organizations to replace their costly appliances with an enterprise-grade cloud-based solution. Based on a global CDN, this service offers the built-in flexibility to support a single data center with multiple servers, data center failover scenarios and Global Server Load Balancing (GSLB). Real-time health monitoring and notifications ensure that traffic is always routed to a viable web server.